Regional daily newspaper the Eastern Daily Press is closing two of its district offices, in Cromer on the north Norfolk coast, and in Diss, a Norfolk market town. This matters to me because the EDP was the first place I worked as a journalist and it was then one of the UK’s biggest local papers, with at least 10 offices, all employing reporters. Some of the offices had one or two reporters, some had 10, and the Norwich head office had about 50 editorial staff. When I joined as a trainee reporter, the big bosses mandated that we worked in at least three different offices within two years. We went out and about on an almost daily basis, talking to people and covering events. These days, national newspaper editors dream of having as many reporters as the EDP had in the 1990s. So why does this matter? And should anyone care when the small newspaper office in Cromer closes? After all, as the management of the EDP said, everyone is online now, so we can do business digitally. And, yes, most of us can communicate by email and we could email our news tips to a far-flung newsdesk. We could, but perhaps we won’t bother. And, yes, you can do business digitally: we can send money and adverts around the world at the click of a mouse. But the stuff at the guts of a local newspaper, the finding out what is going on and hearing a sniff of a story in the pub, will that still go on or will reporters be left to depend on social media as a source? If no local reporters are left living and working in these communities, are they really going to care about those places? Will they even know who to call, or who to email? When a massive fire starts down by the King’s Lynn docks, will anyone from the local newspaper be there to see it (as I was one midnight when I saw the flames out of my bedroom window)? The answer is clearly that they will not. News will go unreported; stories will not be told; people will not know what has happened in their towns and communities. Local newspapers (and, to some extent, local radio stations) were, and in some places still are, fighting for the little guy against the monolith for the old person, say, who is inundated by noisy construction work morning, noon and night. They bring to the attention of the public a council plan to close a massively popular library, or a bid to cement over a local swimming pool and turn it into flats. They cover a big crown court case about a million-pound corruption that ends with shops closing and jobs being lost. When things went wrong, the local media were there to make sure people knew about it, and what the problems were. They could knock on the door of the powerful and shout for something to change. And, yes, these things don’t have to be done only in print – a website can still cover stories and reach an audience – but if there are no reporters on the ground, and they are increasingly based far away from the stories they cover, they will increasingly miss knowing about scandals, corruption and the death of the totally brilliant grandmother who was the heart of the place. One ex-newspaperman told me he recently walked into a city office to find all the staff for local newspapers from one part of Scotland sitting there, together. They had all become long-distance reporters, at arm’s length from the places they reported on. This is more than an industrial tipping point. This is a gradual unpicking of part of democracy: scandals that need to be held up to the light will get missed; local authorities that spend public money will have no one watching to see if they are doing it according to the rules. Lord Judge is right. It is likely that budget-stretched local newspaper managers will drop the coverage that costs them the most money. The difficult stuff will get ignored and replaced with fun videos of cats and other animals. The person who sifts steadily through a council agenda, page by page, will disappear, to be replaced by a “content manager” whose job is to produce crowd-pleasing clickbait fare. The problem, some argue, is that the public are not really bothered about losing these skills or services. If they were, they would be willing to support them. Local news has to be paid for, and the companies that have been producing it have to make money to survive. If the public don’t care enough to pay for it, they will move on to doing other things. That’s the way the market works. People are willing to pay for a cinema ticket, or to go to the football, or for a Netflix subscription, but right now it appears that not many are willing to pay for local news. And if no one funds it, it disappears. Will it be a case of appreciating local news reporting only when it is gone? There’s even more to worry about when it comes to news vacuums appearing. As people feel more and more disconnected from the place where they live, they move into a state of solitude, not knowing what is going on around them. That breeds discontent, a feeling of being ignored, and when a community doesn’t exist there’s no one to lean on when things go wrong. There is a public right to information about what locally elected officials are doing, but there is no public right to a newspaper. If no one wants to buy it, and if no one cares about it, it is likely to disappear. But there is a lot more to lose than a place when you find detailed coverage of your local football team (much appreciated though that is by many). There are deep societal costs. There are some signs of public discontent which may be linked to declining local news coverage, and might be a sign that people are waking up to what is going missing when local media operations close down or pull away from certain types of coverage. For this issue, we commissioned YouGov to carry out a poll of the public and we found that 40% of British adults over the age of 65 think that the public know less about what is happening in areas where local newspapers have closed down. Also, Libby Purves, a columnist at The Times who started her career on a local radio station, tells us she believes part of the discontent that produced Brexit was about people in far-flung places and regional cities feeling their news and views were being ignored. She also talks to us about her earlier years working on Radio Oxford and the close relationship the station had with people who worked in and around the city. They would march into the centrally located studio and tell reporters when they were getting it wrong, she says. The question is: how can that be replaced today? Can it be done on social media, for instance? Or is it a bit like barking at a tree? You have made noise, but the tree definitely isn’t listening? For those of you who thought that threats to local news were just in your own country, think again. We looked into this issue around the globe and found some of the same problems developing in China, Argentina, the USA and Belgium, among others. We interviewed people in Italy, Germany, India, the UK and Nigeria. The worries are often the same, the reasons slightly different. Many of those who fight for freedom of expression feel that declining numbers of local reporters just make it easier for governments to cover up scandals, leave the public ill-informed, and make sure only the information they want is out there. There are some bright sparks who have ideas about how the important services that local news has provided could work differently in the future. There are people starting their own local paper, focusing on digging out stories, growing circulation and making enough money to keep going. Other ideas are also emerging. The BBC’s local democracy reporters project, discussed in this magazine, is one way of funding specialists who have time to dig through council agendas to find out what is going on. What about finding specialist bloggers with in-depth knowledge on their particular local magistrates’ court, for instance, and having a Gofundme campaign to get up to 3,000 locals to pay £5 or £10 a month for a twice-weekly email of fabulously detailed and incisive analysis of what is happening? Big ideas are needed. Democracy loses if local news disappears. Sadly, those long-held checks and balances are fracturing, and there are few replacements on the horizon. Proper journalism cannot be replaced by people tweeting their opinions and the occasional photo of a squirrel, no matter how amusing the squirrel might be. 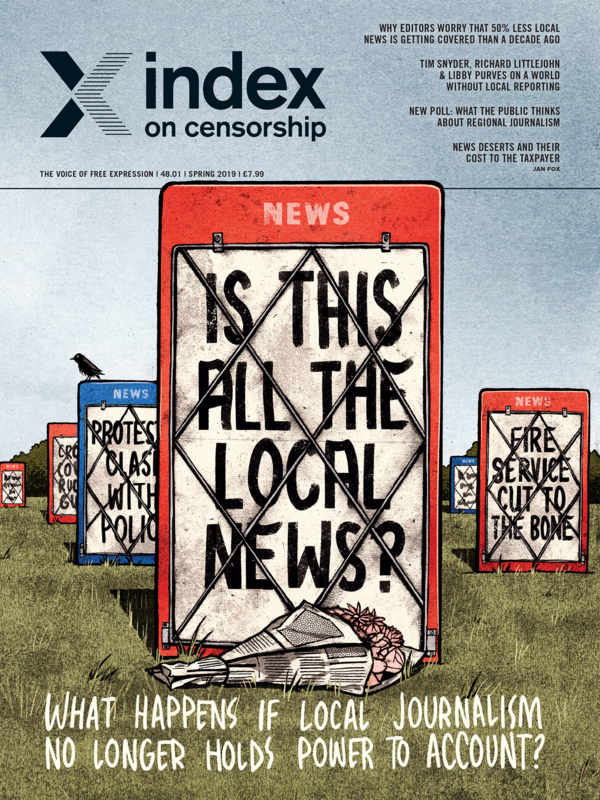 Index on Censorship’s spring 2019 issue is entitled Is this all the local news? What happens if local journalism no longer holds power to account? 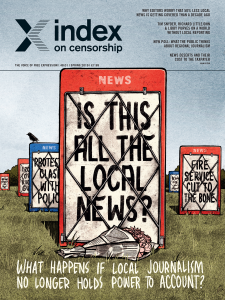 The spring 2019 issue of Index on Censorship magazine asks Is this all the local news? What happens if local journalism no longer holds power to account?